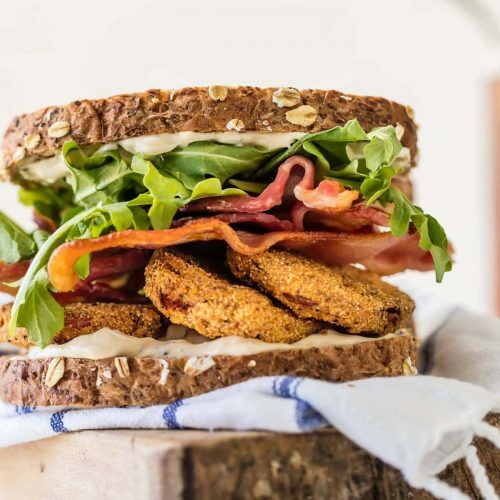 This BLT recipe with Fried Tomatoes and Cilantro Lime Mayo is the best sandwiches ever! Re-imagine this classic sandwich recipe and make it a family favorite. Loaded with herbed fried tomatoes, cilantro lime mayo, arugula, and BACON! Preheat your oven to 400F. Place bacon strips on a baking sheet lined with foil and bake for 15-20 minutes, or until bacon is crippled to your liking. Drain the bacon on a paper towel and set aside. While bacon is cooking, place the flour in one shallow bowl, the egg and milk (whisked) in another shallow bowl, and the cornmeal, salt, pepper, and garlic powder in yet another shallow bowl. Dip each tomato slice in the flour, patting to adhere, then in the egg, and then finally in the cornmeal mixture. Press to adhere as much as possible. Set tomato slices on a plate lined with wax paper. Heat a large skillet with the oil over high heat for about 2-3 minutes. When shimmering, it should be ready to add the tomatoes. They should immediately sizzle on contact. Put all the slices into the skillet and fry for 5-7 minutes, turning once. When the tomatoes are fried to golden brown, remove and place on a paper towel to drain. In a small bowl, stir together the mayo, lime juice, and cilantro. Set aside. When ready to assemble your sandwiches, generously apply the mayo to the inside of two pieces of toasted bread. Layer on the tomatoes, bacon, and arugula. Top with the remaining piece of bread. Serve with Lipton Sweet Tea Flavored Iced Tea for a special nostalgia treat!